Some say Kohl’s is the only store you need for stylish, quality clothing and household goods. With departments in men, women, juniors, baby, housewares, and more, it is easy to see why! They truly carry just about everything you could want for family and home. And when you buy a Kohl’s gift card at a discounted price, you will receive additional savings on your entire purchase! Imagine how nice it will be to save money while still shopping in the store you love! Remember, gift cards make excellent presents too! What began as a single retail store in Wisconsin during 1962, has grown to more than 1,100 locations across the United States. Savvy shoppers know that this store has some of the greatest sales! And guess what? Because gift cards are a type of currency, all store coupons and promotions remain. That’s right! You can use your discounted Kohl’s gift card along with store coupons and promotions to save even more money. Let us not forget about Kohl’s Cash. Just imagine the money you can now save on clothing, housewares and more! Looking great has never before been so easy- or affordable! Not only does this store have quality merchandise for the entire family, but they also have excellent customer service. Stop in today and experience firsthand just how good of an experience shopping can be! From bed, bath, jewelry, and kitchen all the way to sports gear, you will find quality merchandise at reasonable prices! And just think, when you use a discounted Kohl’s gift card you will pay less money for every single thing you purchase! Finally, you can update your entire household without denting your bank account! So why wait even a minute longer when tremendous savings are just a simple click away? 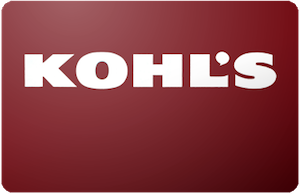 Buy your discounted Kohl’s gift card and save money every time you shop! Clothing, shoes, perfume- you name it- all for less money out of your pocket! Why pay more than necessary? And that’s not all! Cards2Cash offers discounted cards for many of the department stores you know and love! Check out our listings for Macy’s, Nordstrom, Belk, Dillard’s, TJ Maxx, Marshalls, Home Goods Store and more! Best of all, you can look better than ever before, while spending less money! Cards2Cash now buys gift cards! Do you have a Kohl’s gift card you’re not going to use? Cards2Cash will turn your unwanted gift cards into cash. We pay the highest rate possible for gift cards for a variety of shops: restaurants, Clothiers, hardware stores; you name it! Stop in one of our retail locations for fast cash on the spot OR fill out our online form and we’ll make you an offer you can’t refuse. Whether you buy or sell your gift cards from Cards2Cash, we’ve got you covered!